Melville, New York, March 3, 2003 - Olympus America today introduced three new heavy-duty housings to support underwater digital imaging enthusiasts. The PT-014, PT-015, and PT-016 underwater housings are designed for use with Olympus C-50 Zoom, C-5050 Zoom and Stylus 300 or 400 digital camera models, respectively. These models have been available for a long time now from Japan, and this press release probably means that Olympus is going to start distributing the housings in the USA. James Wiseman provides an introduction to digital image printing. 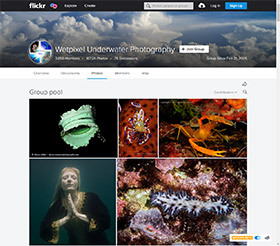 James Wiseman discusses important travel considerations with your underwater digital camera setup. Gates Underwater Products announces the availability of the Sony F717 Digital Still Housing. The F717 is the sibling to the highly successful Gates F707 housing. Available in standard and pro versions, the F717 has several lighting options including NiteRider HID video lights or the Gates F1000ES dedicated flash unit, which is directly and actively controlled by the Sony DSC-F717 camera. Now with the F717, underwater photographers have a third option -- using any Nikonos-compatible underwater strobe unit. Owners of Nikonos-compatible strobes can connect them with the new F717 housing and receive flash synchronization from the Sony DSC-F717 camera. Eric Cheng goes to visit Jim Abernethy to photograph sharks.